There’s no denying that Americans love coffee. There’s a Starbucks on every corner and millions of people gulp down java every day. But there was a time, long ago, when Americans loved coffee’s sibling, tea, as much as the rest of the world. And in recent years, as gourmet coffee has become more popular, people have also started to turn to myriad blends of tea for their morning pick-up. If Americans are married to coff ee, then tea is their mistress. It’s sometimes hard to be among the minority in the land that worships joe, but three women have opened teashops on the Island. They’re off ering brews and accessories that aren’t available at gourmet coffee places and they’re guiding people beyond Earl Grey to exotic imports from India and China, delectable baked goods to go with them and a pleasant atmosphere in which to enjoy it all. 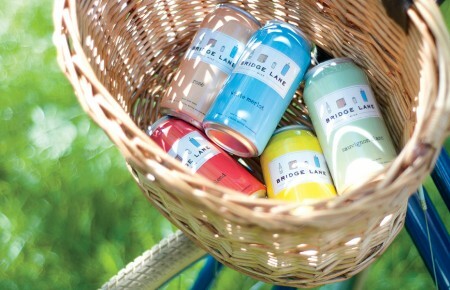 Long Island’s tea revolution has begun, and it is delicious. Kimberly Orlic has been drinking tea since she was a child. Her husband, Ivan, is from Croatia and the two drink a lot of tea when they go to Europe. Owning her own store had always been a dream, but it had to be under the right circumstances. Orlic quit her job at Hofstra University, where she had worked for 22 years, and opened A New Leaf. 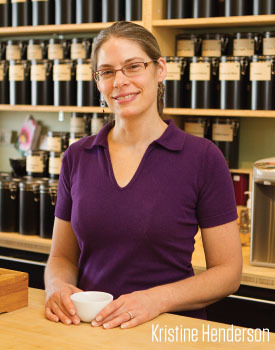 Now she sells more than 100 types of tea (mostly flavored, like Cote d’Azur Garden, Wild Monkey Marsala, Long Island Strawberry Green Tea, and one of my favorites, the Monk’s Blend) as well as teaware. The store has a small seating area, but most of Orlic’s customers buy in bulk instead of by the mug. The large front windows look out onto an idyllic street in the downtown, making it an ideal place for people watching. The subtle smell of tea fills the space. The hundred different blends that Orlic sells come together to create an aroma that is arousing to the senses and soothing for the soul. The centerpiece is also Orlic’s favorite part: The sensory table. Sixteen clear glass teapots hold a selection of some of her newest leaves. Customers can open the pots to take in the aroma for a sense of the flavor. The teas rotate as the seasons change and new blends come in. The store caters slightly more to the popular tea market. Orlic sells many flavored blends that her customers love, as well as more than 30 single-estate teas. Connoisseurs enjoy these for their high-quality leaves and their pure, unaltered flavor. Kristine Henderson accidentally fell in love 20 years ago when she unknowingly ordered loose leaf tea from a catalogue. She hadn’t been a fan previously, but tried the loose variety and loved it. As her customer base grew over the years, Henderson realized she had enough of a following to open her own store. 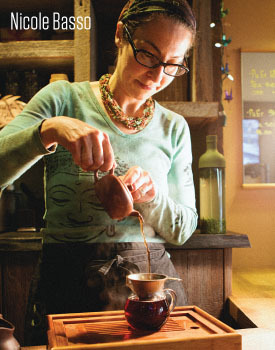 She found a cozy space in West Sayville and opened Infuse Tea Bar. Today she carries more than 300 styles of tea. 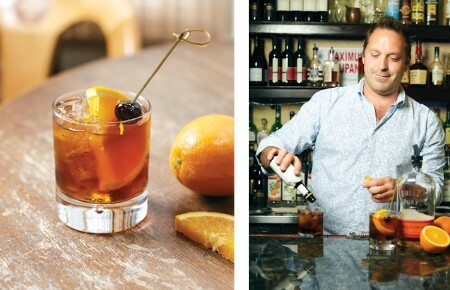 Jars are everywhere—on shelves behind the bar, under the bar and tucked away in cabinets. 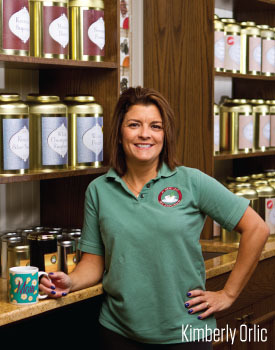 About 10 of the teas are seasonal blends and around 30 of them Henderson made herself. For Basso, it began during her days at Skidmore College. There she developed a love of Asian culture. Her husband, Toshi, is Japanese and his sister would often send Basso delicious Asian teas. In 2001, the couple moved to California, where teashops and bars are more common. After a few years, they moved back to Long Island and Basso started to get involved in locally sourced food, which led her to the farmer’s market. Her friend Brian, who was running a stand for the Golden Earthworm Organic Farm in Riverhead, encouraged Basso to start selling her teas. 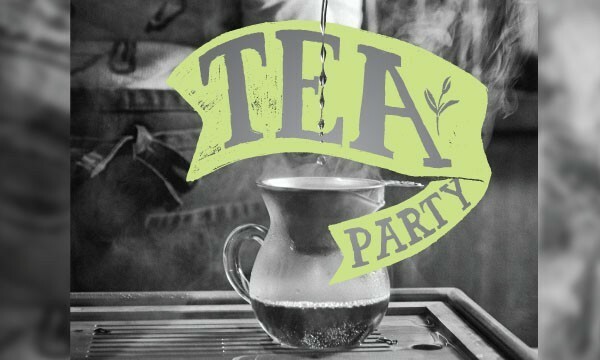 How to: Host a Tea Tasting: Hosting a tasting at home isn’t as hard as it seems and can help spread a love of good tea.